Film Critic, Broadcaster and Musician, Mark Kermode returned to Cinemagic for his annual Film Night with a special screening of Cartoon Saloon's 'The Breadwinner' - his movie of choice for this year's Cinemagic audiences. Mark presented the Oscar nominated Irish animation Studio Cartoon Saloon with a Cinemagic Leading Light Award for their contribution to animation filmmaking and the award was accepted by Tomm Moore, Nora Twomey and Paul Young. The Cinemagic Festival screened all three Cartoon Saloon movies (The Secret of Kells, Song of the Sea, The Breadwinner) on Saturday 20th October and the crew participated in introductions and q&as. 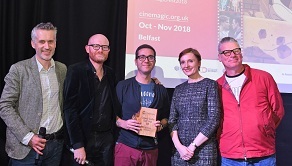 The event was hosted by Brian Henry Martin and produced by Cinemagic, as part of a host of film opportunities at the month long festival, and presented in partnership with QFT 50- a season of events in October celebrating 50 years of independent cinema at Queen’s Film Theatre. The Cinemagic Festival runs throughout October and November.